Antsy McClain's long-awaited follow up to his popular solo album, "Time-Sweetened Lies," took 8 years to complete. "Limited Edition Prince" was originally released for download-only, but the response was so favorable, it is now made available on CD. "Limited Edition Prince," was written during and after the passing of Antsy McClain's mother and father in 1999 and 2000 respectively, and recounts the difficulties of dealing with that change. Antsy turned to family, friends and countless books for meaning, comfort, and peace. As time passed, he shaped a new, wider perspective of the world. And as everything began to change, inevitably, so did his music. Antsy has called this "the most important album I could ever make," citing the issues he worked out while writing, recording and mixing the songs. He plays most of the instruments you'll hear on the album, with a few friends pitching in to help. Tommy Emmanuel plays drums, Edgar Cruz plays bass and Tim Lorsch adds strings. Guest appearances by some old band mates also add color, with Bruce Wandmayer and Jimmy Jackson from The Trailer Park Troubadours lending their expertise on "All's Fair in Faith & War." A collection of love songs, "Limited Edition Prince," addresses the impermanence of life as we try to accept the changes that came so fast and furious during difficult periods in our lives. 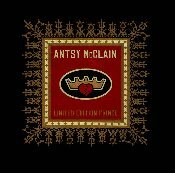 The music is sweet and simple, and the lyrics are laced with poignancy and longing, making "Limited Edition Prince" what fans of McClain's music are calling "a masterpiece." For anyone who has never downloaded music or has no way of playing MP3s, David "Sumoflam" Kravetz (the unhitched.com web guy) has offered his assistance. Please e-mail him at sumoflam@unhitched.com if you need help.